Norddeutscher Regatta Verein has won the second Semifinal of the SAILING Champions League 2018 in St Petersburg, Russia after four days of challenging racing. Norddeutscher Regatta Verein only just beat fellow Germans Deutscher Touring Yacht Club by 2.8 points, with Russia’s Navigator Sailing Team in third overall. Now, 32 clubs from 12 nations are qualified for the big Final of SAILING Champions League in St. Moritz from 30 August to 2 September. 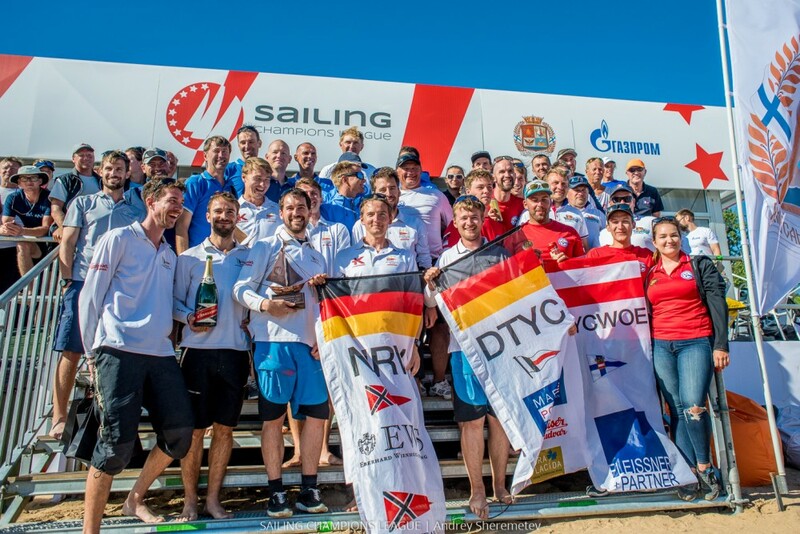 Norddeutscher Regatta Verein (NRV) mastered the most challenging of river-racing conditions in St Petersburg to win the 24-team Semifinal #2 of the SAILING Champions League 2018. It’s a repeat victory for the German club which won in Russia a year ago. Across the four days of competition, Navigator Sailing Team from Russia managed six race wins across 16 races, an impressive number of bullets. However, no one could match the consistency of NRV which scored five bullets but also never scored worse than 5th in any of the races, each of which was an eight-boat short-course windward-leeward contest. While last year’s wind came from every quarter and every day brought a very different race course, 2018 was blessed with four days of westerly winds. Two days with lighter winds, two days with stronger winds, but always sun and the summer conditions drew big crowds of spectators to the banks of the river where they enjoyed world-class racing right in front of the historic Peter and Paul Fortress. Boathandling was critical on the final day, with the winds gusting close to 30 knots and many crews unable to control the boats through manoeuvres, often resulting in some spectacular wipe-outs and broaches. The shoreside spectators loved the show, as did those who tuned in from around the world to enjoy the live broadcast by SAP. In total, 16 of the 24 teams in St Petersburg have qualified for the SAILING Champions League Final in St Moritz a few weeks from now. The 16 clubs from Russia will join the final’s host club Segel-Club St. Moritz, the SCL champion from 2017 Yacht Club Costa Smeralda and the 14 clubs who qualified from Semifinal #1 in Porto Cervo back in June, making it 32 international clubs from 12 nations who will be competing high up in the Swiss Alps for the title of “Best Sailing Club of the Year” from 30 August to 2 September. Did you miss the races of SAILING Champions League? Just visit sapsailing.com and click through the SAP Sailing Analytics for replays of all races and different and interesting statistics about the action on water. You find the overall results on sapsailing.com! Click here for the list of qualifiers.